LIAM FINN has joined Widnes Vikings on loan for the remainder of the 2018 season but will then return to join the Wakefield Trinity first team coaching staff in 2019. With almost 400 senior appearances, the Ireland international takes quality, experience and leadership to the Halton Stadium for a crucial stage of the season. 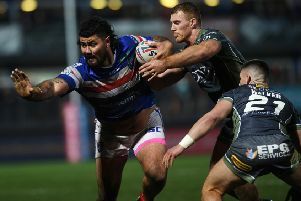 After helping Castleford Tigers reach the Challenge Cup final in 2014, Finn moved to Wakefield Trinity in 2015, becoming an influential figure in their resurgence in recent seasons. Liam supported the club to achieve a run of consecutive top eight finishes, delivering a string of highly impressive performances for Trinity. Trinity chairman, Michael Carter said: “Liam has been a fantastic part of this club’s journey over the last three years. I am delighted that Liam has agreed to become a part of our first team coaching set up from October for the next two years. This loan move to Widnes allows Liam to play out his final season of Super League rugby.